Browse Kuhn’s Online Ordering for Tractor Parts from Oxford, NY, and you will find everything from ignition, starters, seats, manifolds, radiators, decals, carburetors, gauges, and rims, steering wheels to tractor hoods, fuel tanks, and tractor lights. We also carry tractor service manuals. Kuhn’s can provide you with after-market replacement tractor parts for repair. Our online store product line, emphasizes antique tractor parts, including Allis-Chalmers, Case, Ford, Farmall/International, John Deere, Massey, and Oliver. With 14 shipping points throughout North America, we will ensure our customers have access to convenient and on-time service. We make every effort to ship from our closest location to reduce shipping time and charges! Customer service and satisfaction is our number one goal at Kuhn's. One visit and you'll know why! Let the professionals at Kuhn's Equipment Repair & Tractor Parts help you! 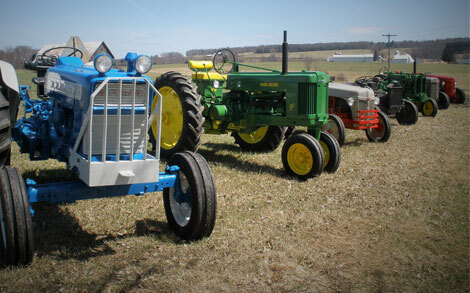 We specialize in tractor repair services for our Central New York customers and beyond.